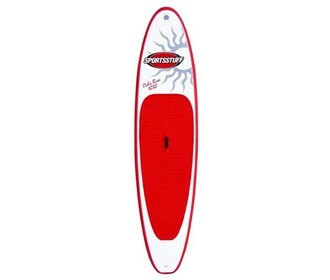 The SportsStuff 55-1030 is a Ocho Rios high pressure inflatable paddleboard that is lightweight and fast. It feels similar to a hard board and supports paddlers up to 220 lbs. It provides a large EVA traction pad, stainless tow and leash rings, and 1 detachable tracking fin. The Sportsstuff Ocho Rios 1030 Isup has many exciting features for users of all types. See the Sportsstuff Ocho Rios 1030 Isup gallery images above for more product views. The Sportsstuff Ocho Rios 1030 Isup is sold as a Brand New Unopened Item.